DirectPlay must be enabled to run on Windows 10. Co-op multiplayer mode from console version is not present. 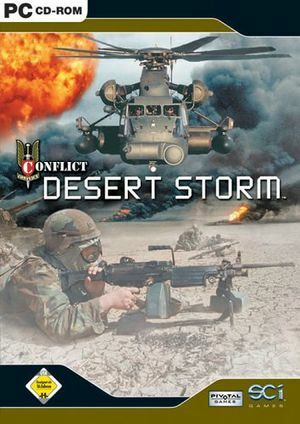 Go to HKEY_LOCAL_MACHINE\SOFTWARE\Wow6432Node\Pivotal Games\Conflict Desert Storm\Device Settings or HKEY_CURRENT_USER\SOFTWARE\Classes\VirtualStore\MACHINE\SOFTWARE\Wow6432Node\Pivotal Games\Conflict Desert Storm\Device Settings. Editing graphical settings in the launcher will revert the changes. The values above are just an example. The values differ between different setups and is a matter of trial & error. 4k has been tested only on windows 10 fall creators update. 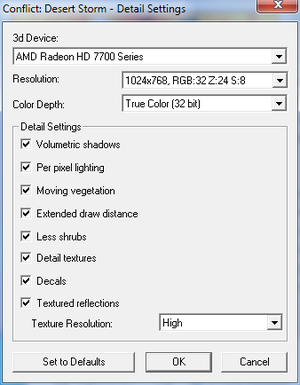 Limit fps to around 60, for example through "Rivatuner Statistics Server". Forced VSYNC through driver settings did nothing for me. ↑ 2.0 2.1 File/folder structure within this directory reflects the path(s) listed for Windows and/or Steam game data (use Wine regedit to access Windows registry paths). Games with Steam Cloud support may store data in ~/.steam/steam/userdata/<user-id>/211780/ in addition to or instead of this directory. The app ID (211780) may differ in some cases. Treat backslashes as forward slashes. See the glossary page for details. There is no co-op in PC version. This page was last edited on 19 April 2019, at 03:21.